The claim that the US military then buried him at sea (“eased into the sea,” as it was described) within 24 hours due to its deep respect for Muslim religious custom is also laughable considering the US’s systematic use of assassination, torture, indefinite detention, and extraordinary rendition against terror suspects over the past decade. Nevertheless, it is almost certain that the body was bin Laden’s, not only because his supporters have confirmed his death, but also because President Obama would not place his political career on the line by taking such a risky bluff. Many argue that the timing of bin Laden’s death is too precisely attuned to Obama's political needs for it to be a mere coincidence. Obama described the attack so theatrically that it seemed as if he himself had marched into the compound, donning a cape made from the American flag, and strangled bin Laden with his bare hands while reciting the Pledge of Allegiance. While the CIA claims to have only known about “the target compound” since August 2010, Pakistani officials maintain that the ISI, Pakistan’s secret service, had been informing the CIA about it since 2009. However, the reality is that both the US and Pakistani military-intelligence networks have repeated falsehoods about bin Laden and Al Qaeda—about their own respective roles and the connections of bin Laden to their mutual ally, Saudi Arabia. Even if one accepts the US claim that the CIA only learned about Osama’s hideout last August, it is still unclear why the US delayed the operation for nine months. Why was the appropriate time to hunt down the supposed mastermind behind 9/11 only now? There have been no major terror threats either prior or subsequent to the killing of bin Laden. According to all serious analysts, Al Qaeda had become a much weakened force, inconsequential except to provide a justification for the US war machine. The lack even of any claims of an impending security threat from bin Laden underlines the fact that the operation was undertaken by the Obama administration primarily because of domestic political calculations. The thinking seemed to be that a victorious military action to “take out” bin Laden could be exploited to bombard Americans with a deluge of militarist and jingoistic propaganda which would not only deflect attention away from the economic crisis but help bolster support for the billions being spent on a losing war in Afghanistan. 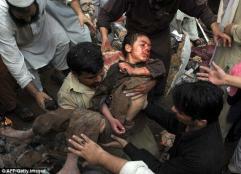 It already has had the added effect of defusing any domestic criticism of the US’s drone attacks on Pakistan. It would also enable Obama to rebrand himself as a “wartime president,” detaching himself from the pledge of “change” emphasized in his 2008 campaign and bringing his administration ever closer to the military, the intelligence agencies, and with influential sections of the US ruling elite. Bin Laden’s death clearly sparked off celebrations among Americans living across the globe. News channels were cluttered with coverage of the “heroic triumph,” and statements of government officials from all over the world demonstrated exuberance at the death of the sick old man–who was probably living under house arrest in the custody of Pakistan’s military intelligence. With this “landmark” victory in the “war on terror,” Obama certainly has both increased his chances for re-election next year and ensured that no one in the Republican camp can accuse him of pacifism. Among Muslims, however, conspiracy theories and genuine skepticism are rife. Some claim that bin Laden was not killed, while others believe that he was killed long ago and this entire episode was nothing more than a political scam. Given the recent record of US mendacity (“there are WMDs in Iraq,” “the US does not torture,” etc. ), it was not surprising that the Muslim world was reluctant to believe yet another fairytale of American heroism. Of course, the majority of Muslims’ denial of Washington’s version of the incident and their criticisms of the US are not due to some deep affinity with Al Qaeda or bin Laden, but rather out of disgust for America’s foreign and domestic policies since 9/11 (and before). When announcing bin Laden’s death, President Obama proclaimed, “Justice has been done.” But it was clear that Osama’s execution had nothing to do with justice. Bin Laden perhaps could have been apprehended and tried for charges related to 9/11, but the trial would have brought under public scrutiny the embarrassing history of bin Laden’s relations with the US government. This was of course a relationship that began with the CIA funding and arming of the Mujahideen to fight Soviet troops in Afghanistan. Once the Soviets were defeated, the Mujahideen became a threat to the US presence in the Middle East and as often happens in US foreign policy, today’s ally becomes tomorrow’s enemy. In his speech following the raid, Obama could have chosen to put an end to the “war on terror.” He could have repudiated vengeance and war, and embraced cooperation and real justice. He could have declared a new US foreign policy based on respect and equality of other nations that addressed the real grievances of the world’s people against America. Sadly, he chose not to and instead made it clear that US intervention will remain at full throttle. Indeed, the decision to continue these military campaigns makes it obvious that Washington considered the “war on terror” as nothing more than a useful pretext—and Osama as a handy bogeyman—for legitimizing the US’s “permanent war” in the Middle East and Southwest Asia. But is there any deeper political significance to the death of bin Laden beyond the clear boost that Obama will get for his re-election? Although bin Laden’s death has been proclaimed by Western mainstream media as a moment of “historic” significance, neither the Obama administration nor the media have demonstrated how this will stem the tide of militancy or lead to the end of the disastrous US wars and occupations. Indeed, the dangerous precedent of this brazen US violation of Pakistani sovereignty—and the frequency of deadly drone attacks since—is only intensifying anti-Americanism, and political instability in general, in nuclear-armed Pakistan. In fact, reports that the operation undertaken to kill bin Laden involved backup plans for an armed confrontation with Pakistani forces highlight the decidedly dangerous nature of the raid. The operation threatened direct military hostilities between US and Pakistani troops well inside Pakistani territory and in close proximity to Pakistani military facilities. Thus, instead of ushering in an era of “peace and stability” to the region, the incident has aggravated the anxieties of Pakistan’s rulers about the reported US strategy to militarily intervene in Pakistan in order to destroy its nuclear weapons arsenal should Islamists appear to be taking power or the Pakistani state show signs of collapse. Reflecting their utter indifference to the potentially grave consequences of the operation, Obama and other senior administration officials have not only defended the risky raid and celebrated the killing of Bin Laden. They have made it clear that the US is prepared to initiate more such actions inside Pakistan. Ultimately, the killing of bin Laden is a substitute for both real justice and real victory—the latter of which the US has failed to achieve in Afghanistan. It is also a PR spectacle intended to divert attention from the real confrontations the US Empire is facing. The unfolding Arab revolution, for example, is a glimpse of that resistance. Junaid S. Ahmad teaches in the Faculty of Law and Policy, Lahore University of Management Sciences, Lahore, Pakistan.